If you have an iPad then our latest gadget in the PocketGPSWorld.com Christmas Bumper Bag of Goodies will be of interest. Nemesis have kindly donated a Brodit iPad MultiStand. When using the multi stand it is easier to carry the iPad around with you. It diminishes the risk to drop it, since the stand is easier to grip than the device itself. You can use the stand in several angles, just adjust the position depending on area of use. Also adapted for use in the lap. Made of black ABS plastic. 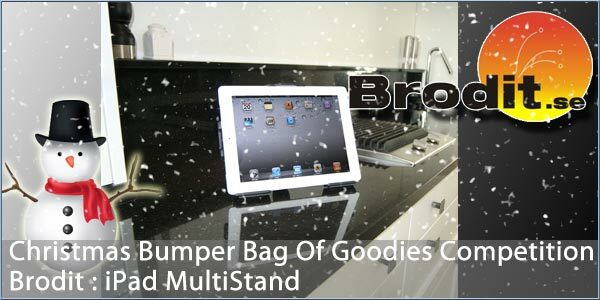 Check out Brodit MultiStand product page for more details. when does the competition start ? anybody know ? On Friday Darren will reveal all. He will also post the details for entering. This will also be in the newsletter that will be delivered from around 7am. Full details will be announced next Thursday so that they can go out in the Friday Newsletter.